Abstract: At just over $900USD, for a 18.1" TFT LCD the CML181SXW has to be one of the most aggressive priced LCD's on the market today. Hitachi are firmly entrenched with the corporate markets who need cost effective displays with the best amount of features to keep the workers happy. At just over $900USD, for a 18.1" TFT LCD the CML181SXW has to be one of the most aggressive priced LCD's on the market today. Add to that support for both DVI and analog video signals, integrated small form factor speakers, and what is probably the most attractive feature for the board office worker - a headphone jack and volume wheel - and you have a large LCD display which should generate a good amount of interest. The bulky design of the bezel signals that this 18.1" LCD is looking at cost effectiveness first and industrial design second, but there are a few interesting tricks round back that save face. Two removable panels pop off in the rear to completely hide the four sets of cables leading from the LCD panel. The wires are hidden all the way down to the very bottom thanks to a cable way. The CML181SXW series uses a 18.1" active matrix TFT LCD with a 1280x1024 resolution screen. That is comparable to a 19" CRT display. 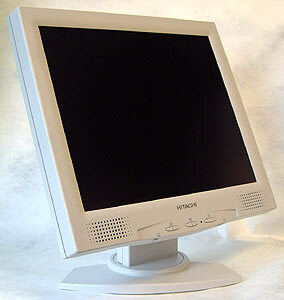 The LCD monitor is capable of displaying 16.7 Million colors and features a 0.280mm dot pitch, contrast ratio of 350:1, brightness of 235 cd/m2, pixel response time of somewhere around 30-35ms and an exceptionally wide viewing angle of (85/85/85/85). Until this point, the widest viewing angles we has seen were 80/80/80/80. The move to 170 degrees vertical and 170 degrees horizontal just means the consumer benefits more than ever. Unlike keyboards, mice and other user interfaces there really hasn't been any standardization of the main controls on the front of monitors or LCD displays. Most of the time this is great as it frees the designers to try many different ideas to find the most user friendly and intuitive set of controls. Sometimes things don't quite develop all the way, and in the case of the Hitachi CML181SXW the control panel is a bit of both. The necessary adjustments like brightness and contrast are all easily accessible, but navigating through the on screen menus are a little bit introverted as all the buttons are largely unmarked for that arena. Luckily most users will not need to adjust much especially if they connect the CML181SXW via the DVI cable. Individuals with analog video cards will want to set the display to "auto adjust", and to do this they will have to go into the OSD and select the correct icon.